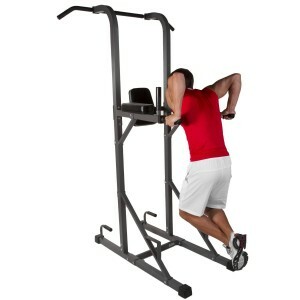 XMark XM-4434 is a durable and high quality power tower with a pull up bar and a dip station for building strength and defining your back muscles, upper body and abs at a reasonable price so you can do your push-ups, wide grip and narrow pull-ups, vertical knee and leg raises and dips. It weighs about 77 pounds so can be moved around fairly easily on its rubber feet that won’t damage your floors. At about 86 inch height the pull-up bar is one of the highest we have seen in tower bars so just make sure your ceiling is high enough (overall dimensions are 86 x 48 x 54.5 inches). XMark XM-4434 is rather simple to set-up (shouldn’t take more than an hour and a half), easy to use and feels quite sturdy to work with, when you’re doing your pull-ups or push-ups. It is resistant to scratch with its baked-on powder coating and very durable thanks to the 14-gauge steel mainframe. Your floors are protected from damage with its tough anti-slip rubber feet. It is quite comfy with the very thick and dense 2 inch cushions and Duraguard vinyl that is stitched twice and resistant to wear and tear. If you already do dips, knee raises, push and pull ups on your own, this will make it a lot more effective, comfortable and easy- simplifying your routine, which is great if you’re looking for an alternative way. Pull up bar is good for your arm and upper back muscles, push up handles are for your chest, twin dip handles (that are 21.5 inch apart) for your triceps and vertical knee raise for your abs and core. And for extra safety all the handles on the tower unit are anti-slip rubber so your hands will not slip. 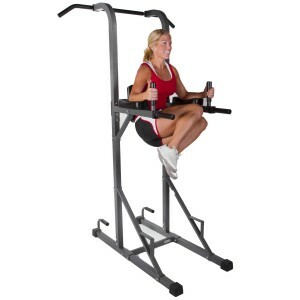 One of the current users mentioned that you need to do the pull-ups properly in the correct form or the unit may lift off the floor, which you can avoid at all times by putting heavy weights on the front legs if this really is the case and this is the observation of one person and in our opinion you should have no problems as long as you assemble it nicely to make it balanced and solid. Having said that this is a great quality power tower with very thick materials that should exceed what most customers’ would expect at this price level, it is not a cheap and low quality unit by any means. You have a choice of two colours- gray or white- you will find on the Amazon product page and both have black upholstery.